Thanks to my job, I need to keep updated on Luxury marketing and innovations that are taking shape there. So this morning I was reading an article on how luxury brands are taking to in-film promotions – particularly for regional films. Increasingly, regional (rather, rural folk!) are beginning to consume aspirational brands which were earlier associated with urban folk. HUL (Hindustan Unilever Limited) has gone a step further than in-film product placement. In the recently released movie, Chillar Party, the movie actually starts (or so one thinks), in a classroom setting with school kids playing pranks on each other. The teacher enters and sees a couple of kids with dirty uniforms. Needless to say, the ad concludes with the (now!) legendary “Daag Achhe Hain” campaign. Wonder if this is a case of in-film placement or a pre-film placement. Incidentally, the legendary campaign was created by Lowe Lintas and R Balki (Chairman and Chief Creative Officer, Lowe Lintas, India) is widely credited with the campaign. Balki, of course, has himself directed 2 bollywood movies – Cheeni Kum and Paa. I attended a very engaging talk by him when he was down at IIM Lucknow for a Guest Lecture session. 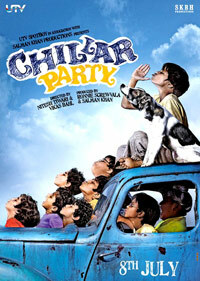 Interestingly Chillar party has been directed by another ad man Nitesh Tiwari who is the Executive Creative Dir (must be NCD now) of Leo Burnett. He’s the man behind the Reliance children commercials and bol india bol commercials I had shared with you when I was working with him. Now Burnett has a number of P&G accounts, wonder why a Unilever brand was showcased in the movie.. Yet to see the movie though..